There is something about 16 months that's a cheeky age. Or maybe a curious age? 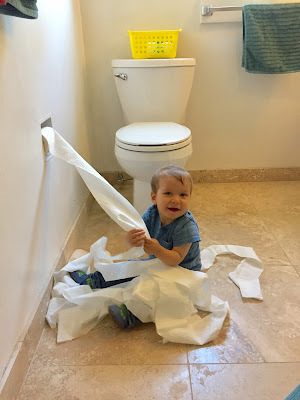 It's the age where you have to move all the toilet paper rolls or they WILL be unrolled. And actually, shutting the bathroom door is better because otherwise the toilet may or may not get played in. The tupperware cupboard gets unloaded five times a day, along with the toy box and bookshelf. So I had to laugh when I found Callum in the above situation, remembering my other two in very similar situations. All three kids are just a couple weeks apart in age in these pictures. Actually, Connor and Isla's pictures are only a day in age apart, but Callum's is a couple weeks before. Also, apparently the first two situations happened while I was in the shower. These days I shower before the kids get up, but Callum still finds plenty of time to roam and get into things because, life/three kids. Can we also take a minute to notice how much hair Connor and Isla had compared to Callum. I was actually thinking the other day how thick his hair is getting...until I saw those full heads of hair! I really do love the curiosity of children, even if it means a lot more clean up for me. Lol oh the q tips! always the q tips! !